My Take on it – Charlie Chaplin was a genius both in comedy and in his ability to satirize society. This movie is one of his best films and even watching it close to 80 years after it was filmed it still resonates both from a humorous perspective and from a comment on society at the time. Chaplin knew that due to changes in technology, he would eventually need to stop making silent movies, but he chose to first make his final silent film a satire of the very isuue at hand; technological advsnces and how they effect society as a whole. This entire movie is extremely funny, but the best scenes are the ones in the factory at the beginning. The mere thought that after hours of making the same movements over and over the body would continue to make those motions always has me in stitches. I love how he chose to use sound in the movie and even voices, but only via technology and not directly from the actors. This makes these scenes even more poignant in showing how technology can change everything. 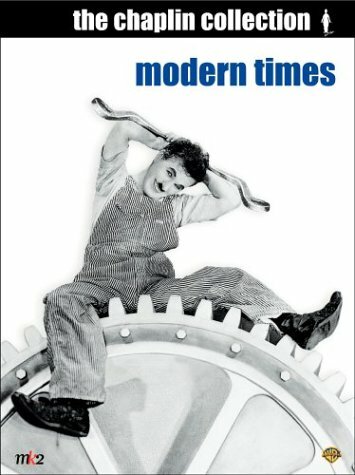 Bottom Line – Great Chaplin comedy that said so much about society and changes in filmmaking due to the advances in technology. The factory scenes are hilarious. Highly recommended! Hilarious film. Shows comedy is timeless.